It is safe to say that there is no place like Varanasi. One of the holiest Hindu cities, it is believed that anyone who dies here attains enlightenment. As a result many elderly people come here to wait to die, sort of like Florida. Varanasi is situated on the banks of the Ganges on a wide curve in the river. Spiced with over 1 million liters of raw sewage from Varanasi alone each day and then garnished with corpses and garbage, the holy Ganges river has become a holy sewer of sorts. This doesn’t stop the devout from swarming the river each morning to bath, pray, give offerings, wash clothes, swim and even drink from the river. The riverfront in the morning is blindingly colorful and chaotic with bells ringing out, music and photogenic holy men sprinkled about like extras in a movie placed there to add magic to the scene. Varanasi old town is a twisting maze of narrow alleyways. It was impossible not to get lost in the old city and almost impossible not to step in cow poop. The streets are clogged with people, bikes and cows – simply walking anywhere is an adventure. Once we found ourselves pressed tightly against a wall to avoid being trampled by a funeral procession on its way to the river. Once I was standing talking with friends when a nearby cow decided to pee and we found ourselves leaping away from the splatter. I even saw a guy walking right down the middle of the road at high noon totally buck naked. I have had nightmares similar to this. I came to find out that he was a beggar, and this was his display that he had nothing. I think he could wear a pair of underwear or shorts and still convey his message. One of the best ways to see Varanasi is from a boat. Everywhere you walk on the river, touts and boat captains shout out “Hello! Boat?” There is something about that expression that was funny to us and we found ourselves saying “hello boat” as a joke all the time. 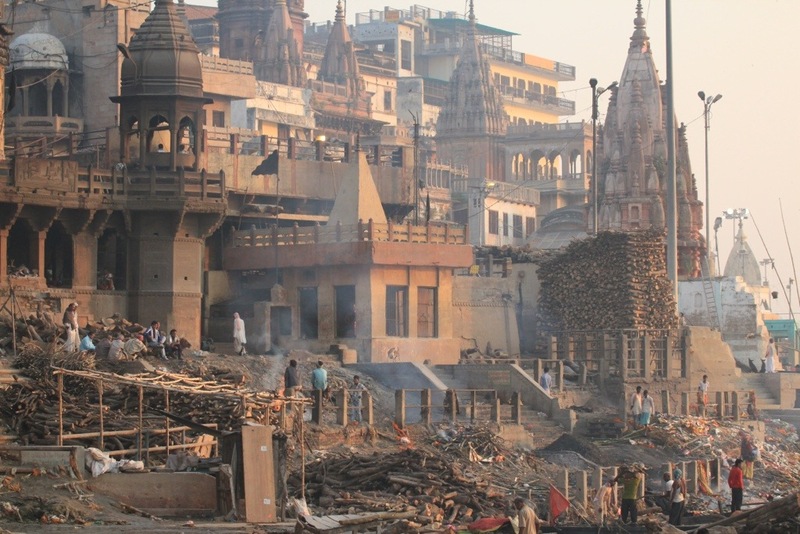 There are two main cremation ghats on the river where crews work 24-hours per day burning bodies of the recently deceased. Lepers, babies and pregnant women are not cremated and thus dumped directly into the river. One evening Kristi, Joe and I found ourselves standing on the “burning ghat” watching about eight corpses simultaneously being cremated. It was night; thick columns of smoke rose up into dark sky, the moon reflected in the Ganges, bells rung loudly and urgently from a nearby temple as men stoked the crematory fires. It was one of those unforgettable moments of travel and how I wish it were not taboo to photograph it, as I could have filled up a memory card on the bizarre experience. The whole scene was strange yet peaceful. Death was all around. As we started to walk away, out of the darkness we heard someone shout from the river, “HELLO BOAT!” Somethings are just not sacred here in India, or maybe death here at Varanasi is just so commonplace that people are used to it. Varanasi is one strange place indeed. The main burning ghat as seen from a distance. Close up photos are not allowed or are in bad taste. One of the many photogenic holy men watching the sunrise. We attended the aarti on the Ganges in Varanasi. It is a ceremony by priests that involves fire, smoke, bells, music and evidently Indians yelling ugly insults at each other. It was a beautiful ceremony for sure; it could have been extremely spiritual, picturesque and fascinating if it were not semi-ruined by the throngs of Indians vying for the best seats and photo ops. Although the show was diminished, getting to see people fight and argue is always a great time. We were told to arrive about 30 minutes before the proceedings to get a good seat. We found a stack of rocks underneath the concrete base of a giant light pole where we had a great view but were not obstructing any views of those around us. Already a large gathering of mostly Indians had taken place on rugs directly in front of the priests and along the best benches, stairways and perches in the area. 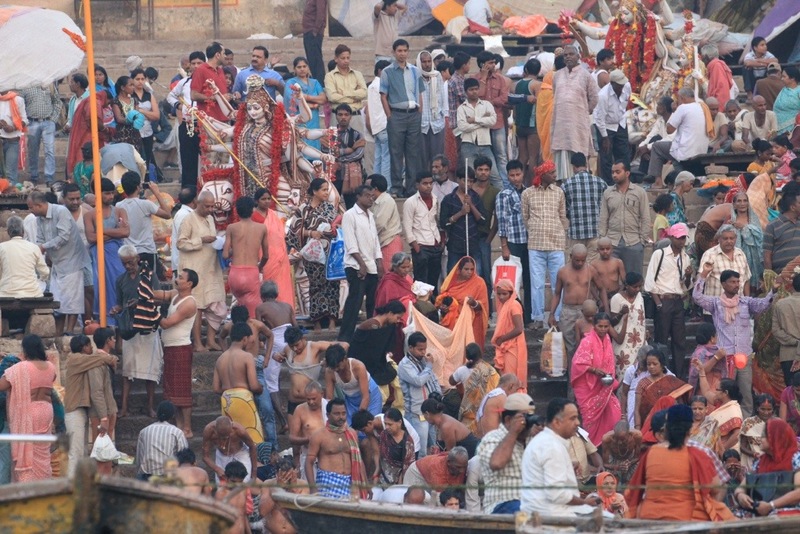 Dozens of boats were moored in the Ganges full of people to watch the ceremony. There was an excited buzz in the crowd, a sense that something special was about to take place. 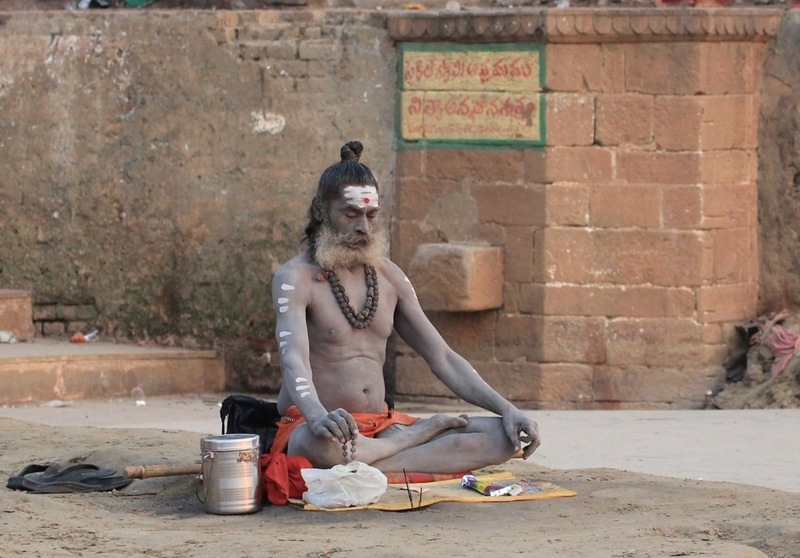 Varanasi is a tourist town, a pilgrimage town, for both westerners and Indians. People from all over this massive and populous country venture to the holy waters of Varanasi to pray and reflect and die. 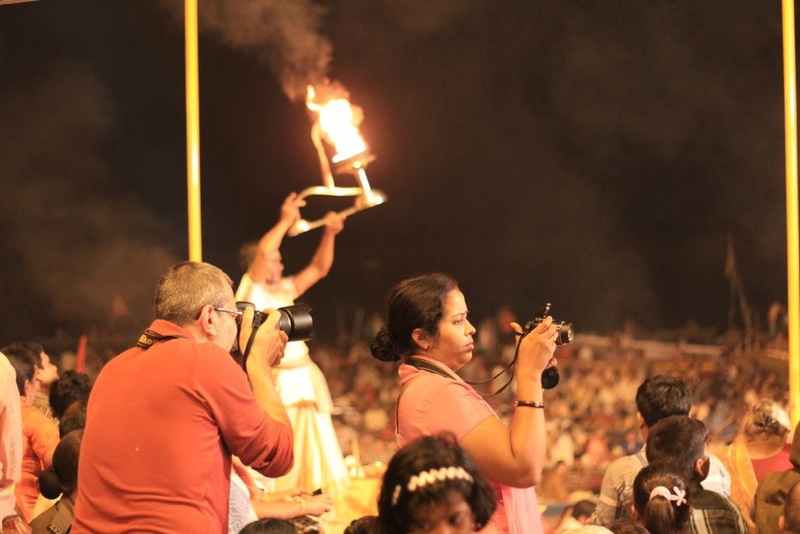 So although the aarti is performed nightly, I can only assume that the vast majority of Indians in the crowd were seeing it for the first time. There was an aisle ahead of us and Indians came and went, looking for seats, taking photos and sometimes just standing there blankly and aimlessly, as Indians are wont to do in inopportune places like crowded sidewalks. As the time for the event grew near, herds of people moved in to stand in the aisle in front of us, obscuring the views of all the people who had been seated patiently for the last half hour plus. A group of about six Indians seated on a platform next to us, who will for now on be referred to as the “shouters,” started yelling at the people who were standing in the aisles, telling them to essentially get the hell out of the way. Arguments ensued. Some of the people, who will for now on by called “standers,” refused to move and yelled back, all with arms flailing and great shouting usually associated with late night disputes in bars. Some ignored the shouters. Others moved on with a casual ease like it had been their intention all along to move and that the shouters had not influenced their decision whatsoever. The main priest got on the microphone and asked everyone to sit in both English and Hindi. A fat lady who eclipsed the priests on our end and blocked the view of the main shouters, was defiant. She refused to move despite being peppered with a barrage of shouts. Some people sat where they had been standing. Many clearly felt that the request to sit applied to everyone other than them. At that time some uniformed officials who looked like cops but had about as much gravitas as mall security guards asked people to sit or move, even herding them at a point. Many of the standers, who had arrived minutes before the ceremony, mind you, still blocked the way of people who had been sitting for an hour to get a good view, people who were clearly positioned in areas designed for the sole purpose of watching the show. The ceremony started. The priests prayed to the Ganges and took places on 7 different pedestals along the bank on a natural stage. It was a beautiful ritual. The priests rang bells, music played and performed what was not quite a dance, but a series of movements. First they faced towards the river, then to the right, then towards the crowd, then to the left, then repeated the movements with increasingly more photogenic items. They started with smoldering punks and elevated to elaborate candelabras. When the big candelabras came out, things got messy. The peripheral standers started to encroach once again on the views of the sitters, inching forward bit by bit, to get a better view. Some people would dart in from the back, sit on their knees and reel off a few photos while simultaneously obstructing the views of the sitters, who would move or adjust some to maintain their view and thus a chain reaction of shuffling, moving and adjusting would flow back up the steps and throughout the amphitheater. Some people sitting close by on the carpet (some tourists, some Indians) just stood up to memorialize the event on crappy point-and-shoot cameras that no doubt had faulty white balance and produced a blurred image in the relatively dark environment. All we could do was laugh. An eight year old girl and father, whom we’d asked to move several times as they kept migrating right into our view, started talking to Kristi. The girl was fascinated by my blonde wife. Her dad would whisper into her ear things to say in English and she’d repeat them to her. Suddenly it was hard to be mad at these view encroachers, as they were evidently nice people meaning no harm. Indians just have different manners when it comes to standing in queues and seating for religious ceremonies. After the fiery climax with beautiful candles, all the boats who were in the Ganges took off like a flood had ripped them from their moorings. We thought that this was the end or very near the end of the show. We were to learn that the show was maybe half over. The priests put down the burning objects and did the same moves with fans and other non-flaming items, read: boring items. At this time, people seated by the stage started to flee the way sports fans leave in the 4th quarter of a blowout. People who had been seated farther afield rushed in to fill the void and at this time there were standers everywhere. Pandemonium broke out and there was no way for us to see from our vantage anymore. The way everyone jostled for position, shouted and defied each other with a certain contempt and the way half the crowd left mid-way through the event startled me. Americans have much better manners than this. India is great at many things and has made many contributions to the world, like chai, yoga and Aishwarya Rai, but they are terrible at being spectators in religious ceremonies. Again amazing stuff! Can’t wait to see all the pictures and hear more stories! I actually am beginning to get a yen to travel. Of course that may just be another reason to put off writing the multitude of papers that I have procrastinated doing! Lol! Everything you describe in this post is exactly why I have no interest in India. Ugh! The thought of all that horrifies me. What did Kristi think of all of it? Kevin – India can be maddening and I have to admit some things are really wearing me out. In line to buy a train ticket the other day the guy behind me was pressed tight on me, looking over my shoulders impatiently. I could actually feel his breath on my neck. We were the last two people in line, mind you. In response to your question about Kristi, she loves India but said that she will have a certain idea of how things are going to be, but then there are Indians there and it is different. This isn’t necessary a bad thing, but the culture is so different it changes everything. Well, I admire you guys for going for it! I don’t think I could do it. I hope you guys are having a great trip despite the challenges. I’m really feeling the effects of not getting vacation. I just had a week off in San Diego, but I need a REAL break. I’m fried! yes! 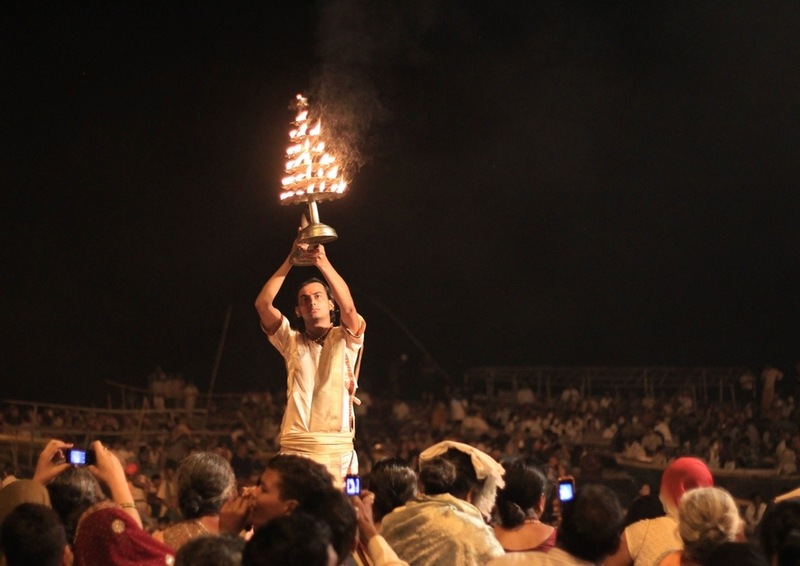 Varanasi is a holy city of Hindus. thanks for describe it for tourists which are visiting in India..
What a modern experience – I can watch the speech on youtube but this is the one chance for a selfie! India was a trip. Such a crazy yet fun place to visit.